The purpose of this article is to provide a very detailed analysis and discussion of the steps we took in order to effectively use a ground improvement system. You can skip to Lessons Learned below if you don’t want to read everything. Before starting the design of the foundation system, we engaged Flood Testing Services to perform a typical soils report. The existing building on the property made it impossible to sample under the proposed new building. Therefore, Flood took four samples around the existing building and classified the soil as urban fill between 3.5′ and 13′. Below 13′ they found a soft clay layer with limited bearing capacity. Our site had typical Chicago soil. For this reason, most contractors use deep foundations for building over 5 stories. The first soils report referenced the possibility of soil stabilization to improve the bearing capacity to allow for spread footings. They recommended Geopier. Ground improvement is the stabilization of soils to increase their bearing capacity, provide stability, control seepage, and provide liquefaction resistance. Several firms offer ground stabilization techniques in Chicago. They include Geopier, Hayward Baker, and Helitech. Each firm has their own ground improvement system. The method they use to stabilize the soil is different. As such, the resulting bearing capacity of the soil post improvement is also different. This is an important factor in choosing the right system. We discovered this the hard way and hope this article can help other developers and contractors make the right decisions for their project. To be clear, ground improvement systems are not caissons. You cannot individually load a Geopier Rammed Aggregate Pier or Helitech Vibratory Stone Column. It is simply a system to improve soil stability. And in our case at 851 W Grand, improving the soil allowed us to build the building on traditional shallow spread footings. Our project was the first 6-story residential building in the Chicago CBD constructed on Geopier RAPs. We spoke with Geopier, Hayward Baker and Helitech to provide soil stabilization proposals. Hayward Baker wanted to install caissons. Geopier and Helitech both offered ground improvement solutions. Geopier was more expensive but had a proved track record and great reputation in Chicago. We initially chose Helitech to provide their system. They call their piers Vibratory Stone Columns (VSC). In 2016, the City of Chicago did not recognize all ground improvements systems. Unbeknownst to me, Geopier had previously conducted extensive testing on their Rammed Aggregate Piers and was approved by the City to use their ground improvement system. Helitech was unproven, and the City required them to submit their system to the Committee on Standards and Tests to be evaluated. According to the City of Chicago Website, “The Committee on Standards and Tests is a panel of distinguished building industry professionals and city staff that assist the Department of Buildings and the Chicago Fire Department with project-specific evaluation of building products, systems, equipment, and design solutions not addressed by the Chicago Building Code.” Before Helitech submitted to the Committee, they submitted their design to us to review and approve. It can be downloaded here: Helitech VSC Submittal. The initial process to prepare a submittal, submit it to the Committee, be heard and receive a response took three months. Helitech submitted the following report to the Committee on October 21, 2015. Two days later the Committee responded in writing with their written approval. However, their approval had conditions. We had to test the ground improvement system to ensure it met the design strength. Testing the system would add considerable time, but it ultimately saved us from making a catastrophic mistake. Read on…. PSI, Helitech’s engineer of record, wrote a testing procedure to ensure the designed ground improvements were realized. Our structural engineer, Stearn-Joglekar, reviewed the procedure and transmitted it to the Committee on Standards and Tests on January 18th, 2016 for approval. It took many weeks of going back and forth with the City to determine the appropriate testing procedure. The maximum allowed deflection at 100% of the design load was 3/8″ and 1″ was allowed at 200% of the design load. Helitech installed 3 VSCs and constructed a test footing on top of the columns. They assembled a test frame and applied the necessary load over 48 hours. 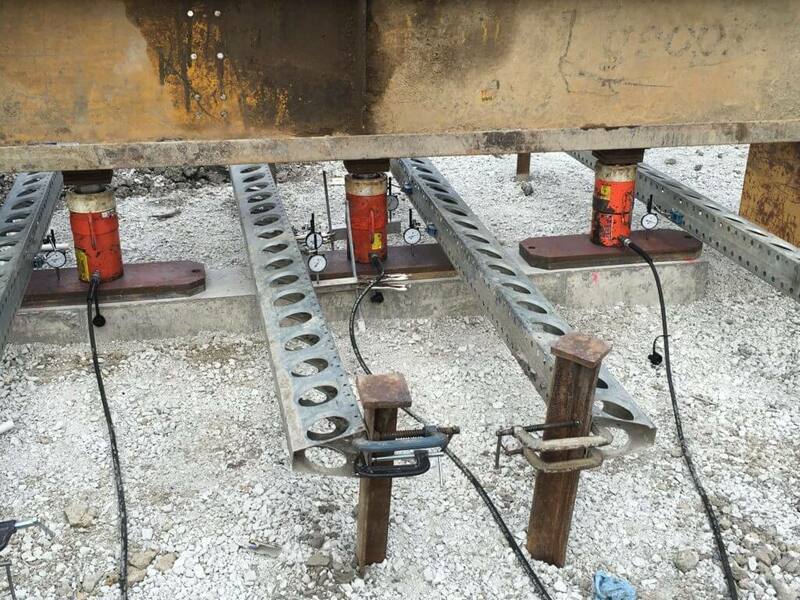 Five hydraulic jacks applied the load evenly across the footing. The movement was measured with precise gauges as shown in the photos. In short, the system failed. You can see from the results below the photos that above 125 KIPS the system failed. Look for the vertical line at 125 KIPS. The footing itself actually settled to one side and could be seen by the naked eye. After the failure (Helitech 48-Hour Load Test Results), Flood took additional soil samples to measure the soil permeability and vane shear. That second report can be viewed here: Flood Soils Report #2 Helitech concluded the soil was worse than expected and the water in the soil was preventing the expected consolidation. Helitech adjusted the design by making the VSCs longer and reran the 48-hour test. Using the same test procedure prepared by PSI, the footing deflected more than 1″ again and exhibited another failure event. Meaning, the soil gave out and the footing settled rapidly. Helitech proposed grouting the VSCs to stiffen them further. We lost several months at this point and could not run the risk of another failed test. We terminated Helitech and engaged Geopier. After multiple failed 48-hour tests and terminating our relationship with Helitech, the City was on high alert. Geopier got lumped into the same bucket as Helitech and had to convince the City, once again, their system worked. We took additional soil samples to further classify the soil and prepared a presentation for the Commissioner. After an extended back and forth, the Commissioner agreed to allow Geopier to test their system. We agreed that if Geopier failed we would switch to caissons. The compaction method is the main difference between the two systems. Geopier first drills the pier. Then they drop 12″ of stone into the hole and compact the lift until refusal. The compaction device is removed from the hole and another lift of stone is placed. Each new lift is compacted until refusal. The result is multiple donuts of compacted stone placed on top of each other. This process stiffens the surrounding soil because of the lateral pressure caused by the donut lifts. Helitech, on the other hand, drills a pier and then vibrates stone into place. Vibration alone compacts the stone and stiffens the surrounding soil. However, we found that vibration, with no compaction, in soft clay does not sufficiently stiffen the soil to pass a 48-hour test. I believe this is why the Helitech system failed. Geopier followed the approved testing procedure prepared by PSI. However, they prepared and submitted their own test procedure for the record. The Geopier RAPs were 28′ deep and 30″ in diameter. Both longer and wider than the Helitech design. Geopier was also about $100,000 more expensive than Helitech for 300 rammed aggregate piers. Geopier actually had to perform (2) 48-hour tests due to rain. They stopped the first test after 24 hours because the location was low on the site. Water started to enter the stone columns and out of an abundance of caution, Geopier stopped the test. They brought in gravel to create an elevated pad where they assembled a new test frame. Geopier passed all the tests with flying colors. The City accepted the results and approved 851 W Grand to use Geopier RAPs to stabilize the soil. In 2016 Geopier quoted 300 Rammed Aggregate Piers (28′ deep / 30″ diameter) for $387,000. The 48-hour load test plus footing cost $31,000. In addition, we had $54,000 of spoils removal. Contaminated soil drove the disposal cost up to $36/CY. Post-installation we covered the RAPs with crushed stone to prevent water from flowing directly into them. The process to design, test, and approve the soil stabilization system delayed the project for six months. Had we started the project with Geopier it’s likely the City would not have required a new load test. Geopier previously proved their system with load testing. However, they were more expensive and I did not fully understand the importance of using an approved solution. My hope with this article is to give other developers and contractors general information about ground improvement systems so they can avoid the mistakes I made. Listed below are my summary conclusions. Local building departments do not recognize all ground improvement techniques. Make sure to understand how your building department will review and approve the design. Before selecting a system, speak with the building department to ensure they are comfortable with the vendor selected and their installation method. Not all ground improvement systems are the same. They perform differently in different soil conditions. At 851 W Grand, with soft clay soils below 13′, vibratory stone columns installed by Helitech did not consolidate the surrounding soil sufficiently. As a result, the soil did not achieve the desired load capacity. Hire a soils engineer, with experience evaluating ground improvement, to perform a peer review of the installers design. Flood did evaluate Helitech’s design but their limited experience with ground improvement systems made me skeptical of their conclusions. Early on Flood concluded Helitech’s design was flawed and would not perform in the soft clay. I would have switched to Geopier more quickly had I believed Flood’s conclusions. Soil stabilization does NOT provide continuously even bearing capacity in the soil. The bearing capacity over the stone column is higher than between them. Make sure the structural engineer designs a footing that accounts for the bearing capacity variation. Initially, Helitech and PSI prepared a stamped letter indicating Helitech’s system would provide even bearing capacity over and between the VSCs. After their system started to fail they later disclosed the soil would exhibit large variations. This caused us to redesign the footings with additional rebar to handle the variation. Cost will go up ff you are constructing a Cold Formed Steel building on spread footings with soil stabilization. Cold formed steel buildings have more load bearing walls, which require more footings and more soil stabilization. Consider hiring the more experienced and proven ground improvement vendor for your area. Helitech had limited experience in Chicago and did not understand the clay soils and how their system would react in them. Geopier, on the other hand, installed and tested their system in the soft Chicago clay on previous projects. The City of Chicago believed in their system because Geopier had previously passed 24 and 48-hour load tests. Plan to cover the Geopiers with crushed stone if the site does not drain properly. Our site was lower than the surrounding grade. We had to install crushed stone to prevent water from getting into the top of the RAPs. Geopiers RAPs cannot be installed closer than 5′ to adjacent basements. Our building was constructed 10″ from the adjacent property and building. We had to install grade beams and cantilevered foundations in order to get the footing next to the adjacent property. In the right circumstance, I would install a ground improvement system again. It does work and can be cheaper than caissons. However, it’s critically important to select the right system from the start. The entire process outlined above caused a 6-month delay. Had we selected Geopier from the start it’s likely there would have been no delays. If you are looking to do a project with Geopier I will happily give them a reference. They delivered a system that works as advertised and at a fair cost. Their engineers are extremely knowledgeable and the City of Chicago trusts them. They are the only vendor I would recommend in Chicago for ground improvement. Vibratory methods NEVER work in clay soils; the vibrations induce higher pore pressure which cannot readily dissipate, thereby causing the clay to be even weaker. The reason the rammed aggregate piers worked was that the ramming effect did not raise the pore pressure in the clay, but the gravel being rammed laterally actually provided a kneading action like a sheeps-foot roller does. This forces the clay aside and changes the effective density and shear strength of the improved soil volume. Clayey soils don’t compact when saturated, so only a volume change occurs. As long as the soil is not fully saturated, the RAP densifies the soil; otherwise it just changes the effective density and shear strength as previously mentioned. Thanks for that comment… I wish you were advising me way back then! I could have avoided a lot of stress and headaches. Are you referring to capping the RAPs with crushed stone. That did not make a lot of sense to me either. But Geopier insisted on it, and once they put it in writing I had to act… Even though it did not make sense to me. I sort of viewed it as an insurance policy.